Bitte lesen Sie vor dem Kauf des Artikels "Gardena 0232-20 Gartenmobil Sackkarre" die vollständige Artikelbeschreibung durch, um mehr über Zustand & Lieferumfang zu erfahren und um Fehlkäufe zu vermeiden!. Nach Mischung der einzelnen Bestandteile funktioniert er vollautomatisch. Durch ihre gro ßen Schraubdeckel lassen sie sich. Well the Bokashi Bucket can do just that. The Bokashi Bucket is very easy to use. RSVP International charcoal filters are made of carbon coated nylon, to ensure an odor-free environment. This pack of three (3) replacement filters is compatible with the Square Bamboo Compost Pail (#PAIL-SQR) and measures 5 ½ inches in length and in width 4 inches. Replace filters every four to six months or sooner, as needed. The filter is not washable, remove prior to cleaning. 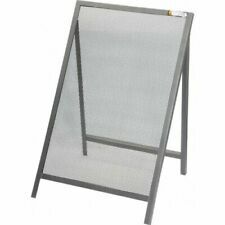 To replace the filter; slide out the old filter form the perforated filter holder and discard. Fit in the new replacement filter by sliding it into the filter holder. Made in Taiwan. 93F Features: Charcoal filter refills. Measures: 5 1/2" in Diameter. See ya later, fruit flies. The result?. Made from recycled plastic and stainless steel. No filters required. Easy to empty, easy to clean. Why do worms need microbes?. Researchers have recently learned that it is not from the organic matter itself, but from the bodies of the microbial life rotting the organic matter that epigeic earthworms derive the bulk of their most vital nutrients. Material: Kraftpapier. - Farbe: braun. Auf dem Foto gezeigtes Dekorationsmaterial wird nicht mitverkauft. - Füllinhalt: 240 Liter. - Stärke: 70 gr/m². - Höhe/Länge: 115 cm. Kein Eintrag SCHUBKARRENSIEB Schiebkarren-Durchwurfsieb 1117 Verz.100x60. Kartons nach Maß. Betten, Kopfkissen und Zubehör. Freundliche und kompetente Beratung. Inklusive Käuferschutz. Lampen und Licht. 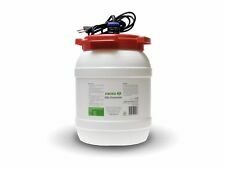 DIATOMIN® Bio-Tonnen Pulver 5 kg. Entscheidend für diese Abbauprozesse und die Geruchsentwicklung ist das Vorhandensein von Feuchtigkeit, die Lebensgrundlage der Fäulniserreger (Bakterien). DIATOMIN® Bio-Tonnen Pulver ist ein natürliches organisch-mineralisches Pulver aus Kieselalgen und Tonmineralien mit der hervorragenden Fähigkeit, Feuchtigkeit aufzusaugen und auf natürliche Weise zu speichern. The RSVP International 2 Replacement Filter Set is compatible with the RSVP Endurance® 1-gallon Compost Pail (#PAIL). These filters are made of carbon coated nylon to help ensure an odor-free environment. Replace both filters every four to six months, or sooner if you feel that odors are not contained enough or if you are frequently emptying the contents. 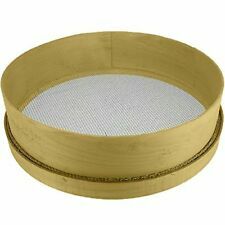 To replace: remove the old filters, fold the round filter in half and insert into upper section of the lid, unfold to fit. Insert the square filter so it fits snugly in the lower section of the lid. Remove filters before washing compost pail. 100 Percent degradable and compostable. Use for food scraps, peelings, egg shells, coffee grounds and other biodegradable waste for composting. Fits most compost keepers and pails. Endorsed by ISAB and OPI. Boxed with dispenser lid. Perfecting for taking with you when you walk your pets too. Each bag is 6 liter, .65mm thick. 14 Inch x 16 Inch/35 1/2 cm x 40 1/2 cm. These 100% biodegradable compostable liners are perfect for the environmentally conscious. Each liner has a six liter capacity and comes in a pack of 50. Simply place the liner in your compost pail and fill as you normally would. Once the pail is full, the fruit and vegetable scraps, along with the liner can be added to your compost heap to biodegrade naturally. Finally a Compost Bin that makes the environmentally responsible task of food scrap collection stylish and convenient. Blending with most any kitchen decor, the sleek bin can be kept within arm's reach during all of your cooking prep so you can effortlessly stash kitchen waste, streamlining clean-up and keeping garbage out of our landfills. An innovative, hinged lid flips up easily with a swift one-handed motion and stays open by itself while you dump waste inside; lid was also designed to click off in a single rotation so it's out of the way completely when emptying scraps for composting. The 85cm (33”) length is designed with the optimum distance in mind for an adult to pick up litter off the floor, preventing any over-stretching or bending. The simple and lightweight hoop easy to use, comfy to carry, robust and just makes any type of litter collection so much easier. Keep your compost filtered and clean with these filter refills! Ideal for use with Norpro items 90, 94, and 95, these filters help protect your kitchen from compost odors. Being eco-friendly has never been easier! Includes 2 filters. Round is 6.5" diameter and the square is 5"x5". schwarz 5 Zinken 28x22 cm mit lackiertem T-Stiel 110 cm. 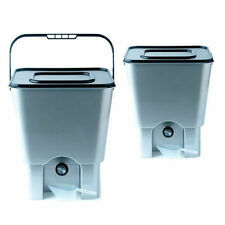 Compost pail Holds 4.4 litres Two carbon filters included Stainless steel Colour: Silver Size: 17cm diam x 28cm . Entscheidend für diese Abbauprozesse und die Geruchsentwicklung ist das Vorhandensein von Feuchtigkeit, die Lebensgrundlage der Fäulniserreger (Bakterien). DIATOMIN® Bio-Tonnen Pulver ist ein natürliches organisch-mineralisches Pulver aus Kieselalgen und Tonmineralien mit der hervorragenden Fähigkeit, Feuchtigkeit aufzusaugen und auf natürliche Weise zu speichern. Gusseted paper sacks are thick and tough and have stitching at the base of the bag. Produced from high quality, multi-ply, Kraft paper which is 100% recyclable. Suitable for vegetable, animal feed, stone, coal and any other product storage and transportation. There is no need to worry! It is that easy. Here is why ✅ EASY TO READ DIAL - We get it. That's why we made the dial extra easy to read. No research needed! Neither do we! ✅ HIGHEST QUALITY MATERIAL - We believe in quality. Riduce inoltre la presenza di cattivi odori. Ogni pretesa al di fuori di tale condizione verrà rigettata. Tale servizio si trova sotto la voce:"Altro Corriere 48ore". Oppure contattare il venditore per maggiori informazioni. Increase your wheelbarrow carrying capacity upto 300% with this heavy duty woven polypropylene easy fit bag. Simply place the the bag in side your wheelbarrow and open up. It's high sides and sturdy structure wil l al low for easy filling upt o a much higher level without spillage. 4 x STRONG LOOPED HANDLES and 2 x SIDE FUNNELS - FIBC SAFE HANDLING GUIDELINES. IDEAL FOR ALL GARDEN/BUILDERS WASTE, SAND and LOG CARRYING. 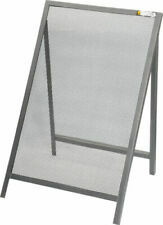 Stabiles Kunststoff-Gitter zum Fernhalten von Mäusen. andere Blühpflanzen. Alle Kategorien. Algen und Grünbelege. Bodengitter aus Kunststoff zum Schutz vor Mäusen und Nagetieren. Algen & Grünbelege. Düngerstäbchen und Kegel. Each bag has a 120L capacity. 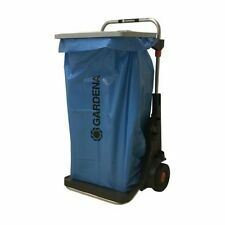 4 x Large Strong Garden Waste Bags (120 Litre Capacity). Stands up right for easy filling. BOKASHI ORGANKO 2.0 The next-gen kitchen composter is more than just another kitchen utensil. Its form enables and enriches sustainable waste management in every household. This exquisitely designed composter compliments the interior of any kitchen. We use it where it is most convenient - on the kitchen counter! The Bokashi Organko 2 is the star of the next generation products for the responsible management of the environment. It surprises with its superior form. It impresses with its usefulness. Instead of hiding it in the corners of your home, you will want to place in the centre of attention on the kitchen counter. We thought about every little detail during the design process. › There is no unpleasant odour and it does not attract insects. › We can use it with just one hand. › With its help, we can make the basis for firstrate compost. Quickly and easily recycles organic and kitchen waste into a rich, nutritious compost that is ideal for retaining moisture in the garden. With its extra wide hatch you will have easy access to your finished compost and it can hold up to 330Lt. Toiletten für Garten und Freizeit – ganz ohne Wasser oder Chemie! Mit vielen Hinweisen und Empfehlungen für Selbstbauer!